I’ve found wind noise is a big issue on the motorbike. Not so much around town at low speeds, but as soon as I get above 40 mph it becomes more and more of a problem. A jaunt on the motorway is literally quite deafening, above 60 mph I can no longer hear the engine, wind noise just overcomes everything else. This is not good, as I have other interests are in music, hi-fi and home cinema. Going deaf or suffering from severe tinnitus will stop me enjoying these. A study by the University of Southampton found that at 70 mph in ear noise can hit 100 dB. To put this in perspective, British law dictates that anyone exposed to more than 85 dB in the work place, must be provided with and must wear ear protection, to prevent permanent damage. At 100 dB, permanent damage can occur after just 15 minutes! So, the moral of the story here, is wear some ear protection. There’s a multitude of different products on the market, from cheap foam inserts to custom moulded plugs. 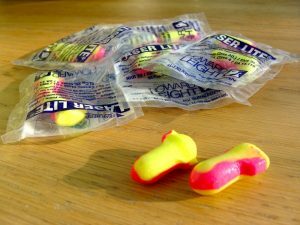 I’m currently using the Laser Lite foam ear plugs. Cheap, simple and actually pretty good. A big bag of them on ebay set me back just a couple of quid. At this price, you can get enough that you always have some handy and not too fussed if they get lost of dirty. They work surprising well and quite markedly reduce noise, which at first gives a strange sensation of isolation when riding. Go careful, as this isolation and reduced noise makes you inclined to ride faster than you think you’re going. Around town I tend not to wear the plugs, as I generally don’t go fast enough to warrant them and I like to use all my senses for awareness of those on the road around me. But out on the motorway, they are essential.